Yes, we did it again this year. 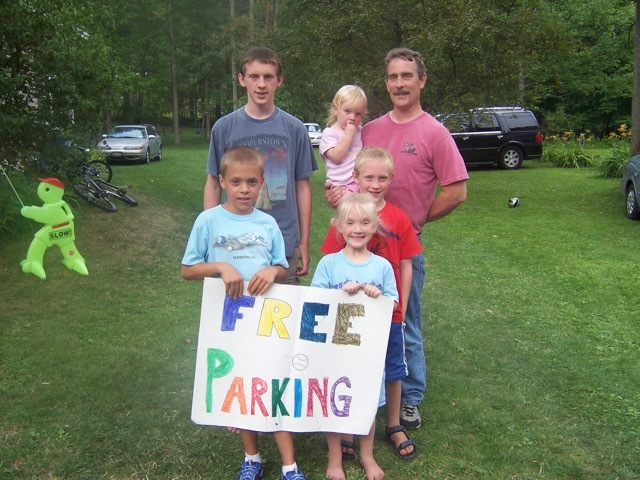 Free parking for the Baseball Hall of Fame Induction Ceremony. A day at a spa might have been nice, I suppose, if I was a day-at-the-spa kind of person. Honestly, today I’d be happy with a haircut, but even to get away for that is hard. If I have a spare hour, I choose to go to the gym for the endorphin rush of cardio and weights, not the hair salon. As it turns out, a day of free parking is better than a day at the spa. The crowd estimate yesterday was 53,000. That’s quite a few, given Cooperstown’s population is around 2,000. Parking lots were springing up everywhere. Lawns. Driveways. Fields. 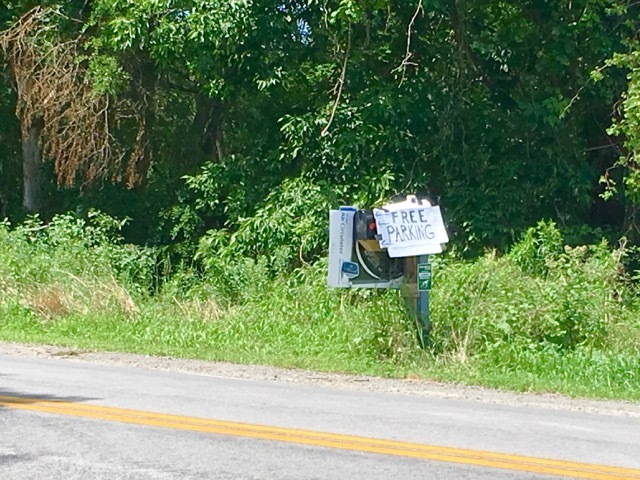 My brother mowed a patch in the field in front of his house and attached the “Free Parking” sign to his mailbox. Cars slowed while the drivers read the sign. Some then zoomed on past, while others rolled down their windows. “What’s the story here?” they’d ask. Sometimes I told them the story — We used to live in town down the road from the induction site and gave away parking on our lawn. When we moved, my brother took up the charge at his house outside of town. It’s a fun thing to do. We love Cooperstown, and we want visitors to have a great time here. Yesterday a car pulled up and the driver asked about it. I told them it was free. “What about the shuttle?” he asked. 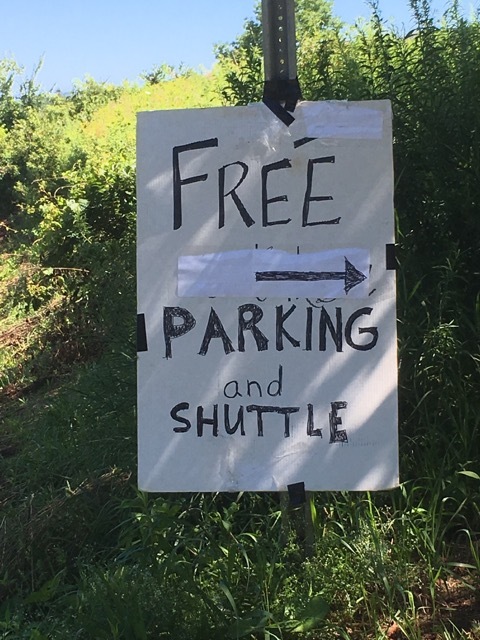 “What about the $30 parking with a shuttle?” they asked. “That’s a mile down the road on the left,” I said. “Okay, thanks. That’s the one we want.” And off they went. “Because it’s fun,” he answered. It’s life-giving — to us. The best part comes when they sit with us after the ceremony in the shade of our trees, drink a soda (free) and eat a hot dog (also free), and tell us a little about themselves. The mother-son duo from Detroit was my favorite yesterday. She was 80-something, and full of spit and vinegar. “Park behind Ohio,” I had told them when they pulled in, referring to car with Ohio license plates. “That’s Michigan always. Behind Ohio,” the woman complained. Later, she told us about her son that almost made the big leagues. “Not me,” her son had quickly interjected. She rolled her eyes, remembering the day, while her son rolled his eyes, having heard the story a million times. And felt life renewed within me. It is also better than a day at the spa. Beautiful! Thanks for sharing. It is interesting, those still wanting the $30 a day w shuttle! Suspicion? How delightful to hear the stories of ‘after the day’ with a hotdog and soda!! Blessings over you and so glad it was exactly what you needed! !